Boat Envy is alive and well in the Whitsundays and no wonder! Portland Roads is the Whitsundays' unchallenged premium bare-boat charter offering. Sailing in the Whitsundays' is only half the story. You'll be sailing through a world heritage listed area, sailing one of the seven natural wonders of the world. The Whitsundays is famous for 74 islands, extraordinary wildlife including the annual Humpback Whale migration, beautiful sunsets, sparkling seas and the whitest of white sand beaches; all there in the southern reaches of the Great Barrier Reef. After years of chartering and listening, the team at Portland Roads - Sailing the Whitsundays offer the best boats at the best price. Their fleet of hand picked charter boats offer you comfort unheard of in the industry and at prices that cannot be matched. Customers love what they do; because they love what they do - Sailing! The world is almost 80 per cent water so stop crowding each other on land, ​get out there and have some fun sailing the Whitsundays, with the team at Portland Roads. Sail the glorious Whitsundays' aboard any of their sailing vessels, including: Portland Roads, Lucy, Ruby Sunday, Due West and Southern Man. You can do it yourself on a Bare-Boat Charter, or request the services of a Sail Guide, or take them out on one of their Platinum packages. Their fleet of boats tick every box; safety, comfort, ease of handling, adventure, romance, fun and the ultimate waterfront lifestyle. Get ready to tick this off your bucket list. 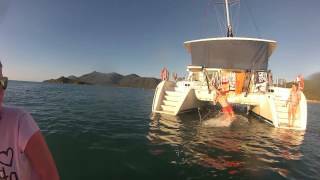 Sailing the Whitsundays' and the Great Barrier Reef with the team at Portland Roads.